I work with a super awesome lady named Juli. Juli has a daughter, Molly, that is graduating from high school this year and she was looking for a unique gift to give all her friends. I had made a personalized pillowcase for a mutual student a while back, so Juli asked if I would be interested in making pillowcases for Molly's friends. We worked out the details and a few days later Juli brought me a large bag full of beautiful, fun fabrics. 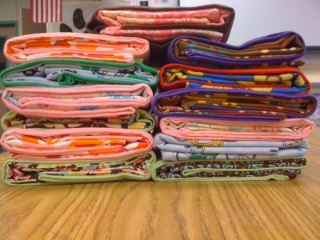 I got to work and made 14 pillowcases. I took a regular pillowcase I own and measured the length and width and used that as my guide. The pillows were easy to make, but the embroidery took a long time...and a lot of thread! I don't know how many times I had to rewind the bobbin!! BUT, they turned out GREAT!!!!! With almost every project I do, I can always find room for improvement. But these were pretty perfect! I love them...gonna have to make a few for Henry and Sam. Maybe in Cars 2 fabric?! I had a little fabric left over from every pillowcase, so I cut 3 inch strips and sewed them together to make Molly (the gift giver) a totally unique pillowcase that had all her friends' fabric in it. I hope she loves it! All stacked up and ready to go!!!! What a great idea! Do you have an embroidery machine? I'm a mom of two wonderful boys, married to a great, geeky man, and a full time teacher. Life is good!